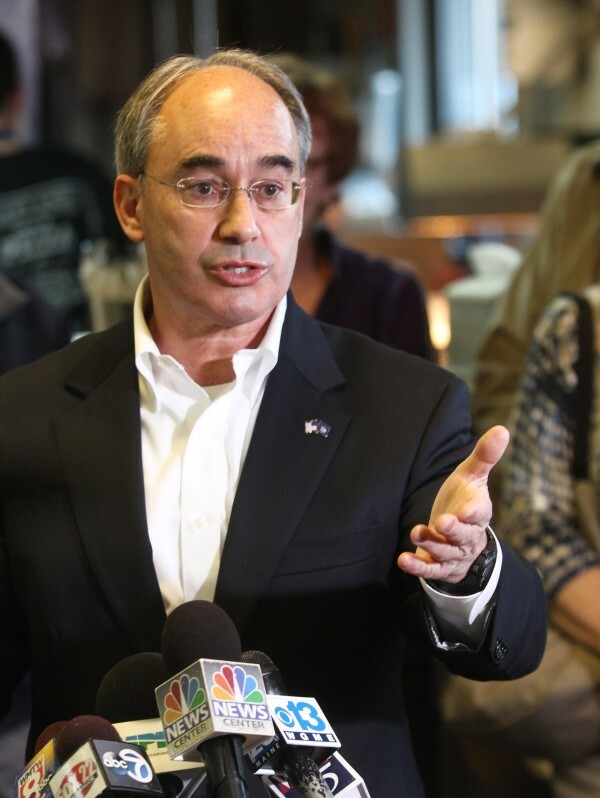 Congressman-elect Bruce Poliquin answers a question during a press conference. Fearing that President Barack Obama’s administration is ignoring the Katahdin region’s opposition to a proposed North Woods national monument, Rep. Bruce Poliquin, R-Maine, said Friday he wants the House Natural Resources Committee to come to the region and hold a congressional field hearing. Poliquin released a letter Friday to committee chairman Rep. Rob Bishop, R-Utah, seeking the hearing, at which the 44-member committee would gather data and hear testimony possibly as part of the early stages of crafting legislation. Bishop’s office did not immediately respond to a request for comment on Friday. Poliquin, who has a bill pending in Congress that would limit presidential authority to create monuments, wrote that the monument campaign continues, despite the region making it abundantly clear that it opposes the proposal by the family of entrepreneur Roxanne Quimby for family-owned lands east of Baxter State Park. The letter drew a sharp response from David Farmer, spokesman for leading park proponent Lucas St. Clair and a Bangor Daily News columnist. Gov. Paul LePage, the state Legislature and the governments or residents of most of the towns closest to the proposed monument — East Millinocket, Millinocket, Medway and Patten — voted against or have leaders opposing the monument and a national park proposal that preceded it. The Penobscot County Board of Commissioners, which governs unincorporated lands around the monument lands, also opposed the park. Bangor City Council, the Katahdin Area and Houlton chambers of commerce and the state’s Penobscot Indian tribe support it. A 2015 survey of 500 respondents across the 2nd Congressional District that St. Clair commissioned found that 67 percent favored a proposed 150,000-acre North Woods national park and recreation area. The Quimby family owns about 87,500 acres near Baxter. “Since that time, it has become all but certain that the landowner and its expensive Washington lobbyists are working closely with the White House to make such a designation, despite the strong opposition on the ground in Maine,” he added. Quimby is a member of the National Park Foundation. Her family’s nonprofit foundation, Elliotsville Plantation Inc., spent $21,645 in advertising and $492,382 in 2014 on “professional and consulting fees” for “research, community discussions, presentations and economic impact studies” on a proposed national park on the family lands east of Baxter State Park, according to Elliotsville’s IRS Form 990 for that year. The 2015 form was not available. The 2014 return lists $489,490 paid to Hilltop Public Solutions, a nationwide firm with offices in Washington, D.C., that “provides business, nonprofit and other entities the strategies and tactics it takes to win modern campaigns,” according to its website. Elliotsville also contributed $100,000 in operating support to the National Park Foundation and $75,000 to the Natural Resources Council. St. Clair said in November 2015 that the campaign was meeting with White House officials to discuss a monument designation, which the president can create via an executive order, as an interim step toward creating a national park, which only Congress can authorize. Poliquin’s letter comes a day after similar statements from LePage and is an indication of how contentious two national monument meetings scheduled Monday might be. At the invitation of Sen. Angus King, I-Maine, National Park Service Director Jonathan B. Jarvis will participate in forums at noon Monday at Katahdin Region Higher Education Center in East Millinocket and at 5 p.m. the same day at the Collins Center for the Arts at the University of Maine in Orono. The public is invited. King will moderate both sessions. Pro- and anti-monument forces have said they plan to attend the meetings. The Natural Resources Council and Sierra Club Maine are co-sponsoring a free bus to enable Portland-area residents to attend the UMaine meeting. One of the leaders of the anti-monument movement, Maine Snowmobile Association Executive Director Bob Meyers, said Thursday that opposition groups were circulating fliers advertising the meeting and the oppositional stance regarding the monument. LePage dismissed the integrity of the forums on Thursday and questioned whether King supported them and the monument against the will of northern Mainers. King’s spokesman said King has significant questions about the proposal and his inviting Jarvis to the region shows his desire to ensure that local concerns are addressed.